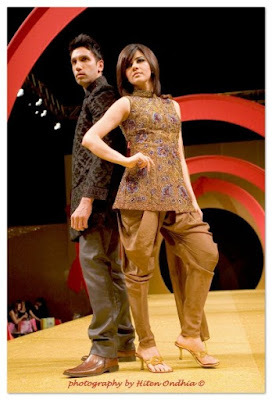 Another part of the asian fashion segment at the Clothes Show Live 2009 in Birmingham was a collaboration by menswear designer Ziggi Studio and womenswear designer Mimi Boutique. 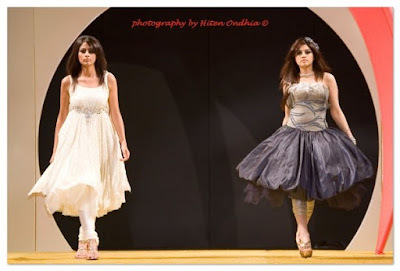 Photos are by Hiten Ondhia. I really like the unique-ness of this outfit by Mimi, in fact there was something different about all the ladieswear outfits, there was nothing usual about the collection. 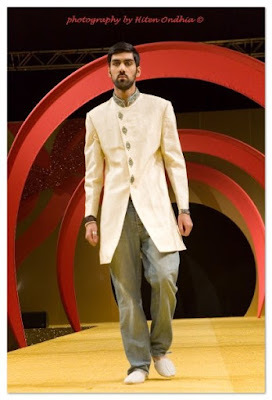 The menswear by Ziggi Studio was teamed up with jeans in some instances showing a real versatility to the jackets. Videos of the show can be seen here. Ziggi Studio will be showcasing a wider range of their collection at the 2010 Asiana Bridal Shows taking place in Birmingham and London so look out for more coverage of them on here soon! The Clothes Show Live hit Birmingham at the start of December this year, full of fashion fashion and more fashion! 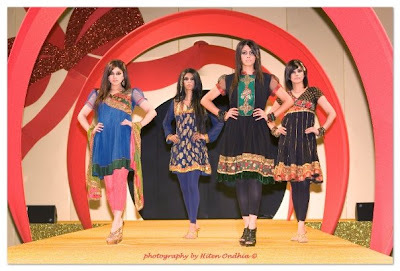 Amongst all the catwalk shows they had a segment which covered asian fashion and Kiran Khan was one of the designers whose collection was on show. If you want to see how the outfits move, high quality videos of the show have been posted on youtube, click here to take a look. 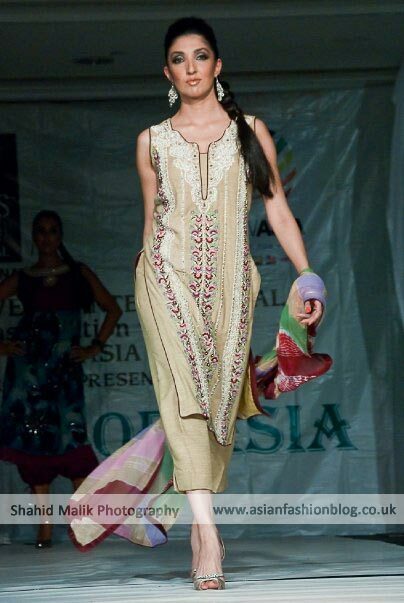 Salina Wardah was another designer name showcasing their collection at the Rhythm of Asia fashion show. Nearly every piece from their catwalk show oozed glamour! 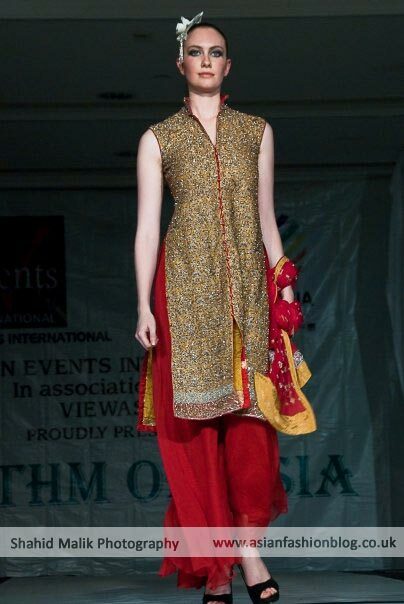 Photos from the show are courtesy of Shahid Malik. This next outfit is definitely a question mark for me, whilst I like the flowing part of the skirt, overall it doesn't create a very flattering shape. What do you think? These next two outfits are probably my favourites. The red and black outfit looks very chic and when styled as shown with the red dupatta it gives it that wow impact. The silver and pink outfit it just pure glamour! From the detail on the top to the ruched effect of the pajama, this is something I'd want to wear to a party. The show ended with more full-on party/wedding guest outfits. All very beautiful, but I was a little disappointed with the final bridal outfit, what do you think? 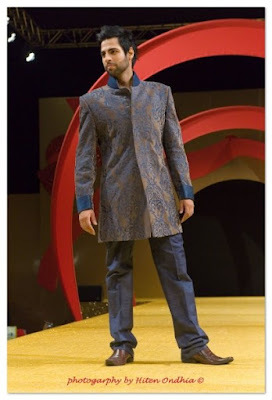 The Rhythm of Asia Fashion show took place in July this year, in London. 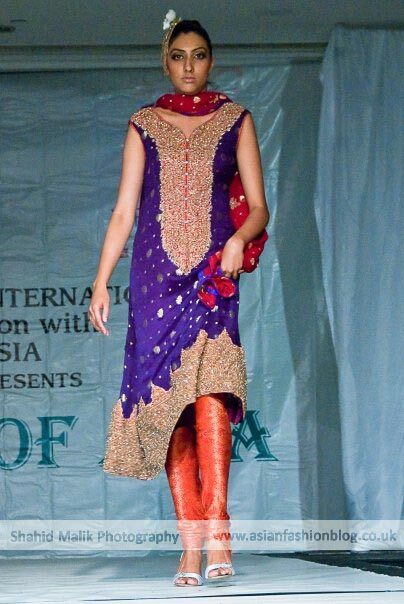 It showcased designs by Pakistani designer, first up is the collection by Nadda Salim. Photography is by Shahid Malik. There were also some less sparkly and more understated black outfits. I'm ok with the first two below but not a big fan of the patterned design on the last black outfit! The majority of the outfits were sleeveless, but there was one striking pink outfit with full sleeves, and all the rest were pretty much the same as before but in different colours!